the city really come alive. This is the result. - Adds buildings and trees that should be visible from any district in the right place. instead of in space or something. - Replaces the tree models with Vurt's trees. Looks much better. plain dull plaque of grass. 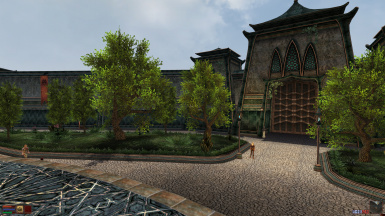 - Replaces Mournhold architecture textures with richer en detailed looking ones. - Changes floor texture. The floor now has the tint which the floor seems to have on the officialMournhold map. 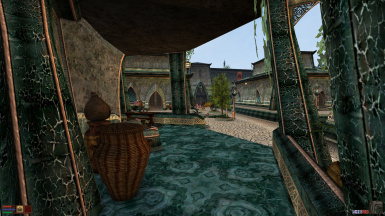 - Adds fountains and lilypads to the water near outer walls. - Adds extra little treecircles, plants, lanterns and ivy. as more barrels, crates, urns etc. to make the city feel like people actually live there, come there to trade and such. 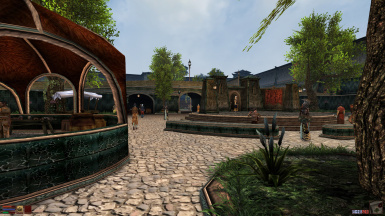 - Adds a few beggars to the Temple Courtyard and the Great Bazaar. - Adds extra little treecircles, plants, lanterns, ivy. - Adds more litter in the districts which are being lived in (Godsreach and Great Bazaar) such as more barrels, crates, urns etc. - Adds 56 unique citizen NPC's + more guards and beggars, spreaded over all the four districts, to make the city feel like people actually live there, come there to trade and such. - Added the Windows Glow - Tribunal Eng.esp, i forgot to add it with the previous release. 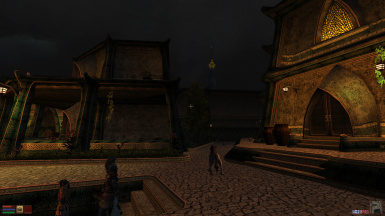 - Moved Godsreach and Great Bazaar back to their exact original height, eliminating all conflicts this mod had with other mods such as Morrowind Comes Alive. - Changed floor texture after reading comment that 'such a big city would never have a sand ground.' I replaced it with small cobblestones, in exactly the same tint. Looks much better! - Changed Amalexia & Mehrunes Dagon statue texture. - replaced cart textures with higher res ones. - Fixed some plants that were stuck in walls and trees. - Changed trees outside the walls, replaced them with several of Vurt's Grazeland trees (included). All credit goes to him of course! 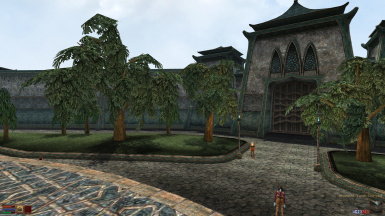 - Changed trees inside the walls, used Vurt's Mournhold and Ascadian Isles trees as the base models and changed the textures to match the original Mournhold style. - Added towers to the outer corners of Godsreach, Great Bazaar and Temple Courtyard, which, weirdly enough Bethesda somehow 'forgot' to add. When you look at the Mournhold map you can clearly see they are supposed to be there! 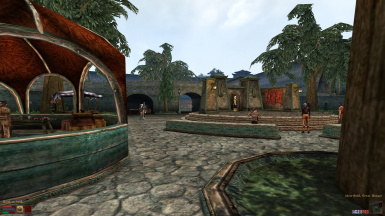 - Fixed the fountains sounds in Godsreach, Great Bazaar and Temple Courtyard, they didn't work before. - Fixed fountain "emitters", some were missing or floating. - Cleaned up .esp, removed unwanted reference and cell changes. - Fixed a huge bug, somehow Salas Valor was gone, I placed him again. He is essential for the MQ! - Fixed another huge bug, almost all doormarkers in Godsreach ended up stuck in the floor. - Fixed the sounds for the fountains, after the attack the fountains were there, but the sounds still not, fixed now. - Fixed 1 lilypad hanging above/in a fountain. - Cleaned up the .esp again. - Mod can be downloaded in 2 versions, one with and one without my new textures. - Removed the Better Heads dependeny. - Removed a little Better Clothes dependency the mod had, it wasn't a big problem, but not having better clothes would make some beasts shirtless. - Only 2 versions, the normal NPC version was too CPU-consuming and could look messy sometimes because of the huge crowd. Now there's the NPC version, which was called Lite before and the No NPC version which doesn't contain extra citizens at all for people with slower PC's. - Fixed some object locations to fix seams. 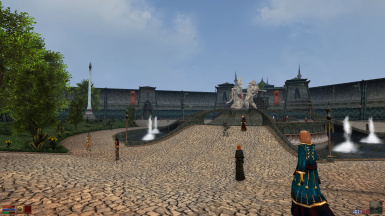 - Changed the fountains in all the districts apart from the Plaza Brindisi Dorm to make them still work after the city attack. It would be unlogical of all the fountains in the city would suddendly stop of course. - Races are all back now, for the Lite version I deleted the first half of every NPC's group, causing the Argonian and Breton to not appear anymore. Have fun! And please comment and rate.